Feeling stressed? Perhaps all you need is a spa day or 2 … maybe even a week. And sometimes Mother Nature has the best idea: a spa treatment in the great outdoors. That’s what I found on a trip this past week into the remote winter wilds of Montanawhere hot springs abound, as does the added bonus of being in a state that recently cracked the top 5 in the happiest states index. Maybe being the sixth-least populated state has something to do with Big Sky Country’s “happy” distinction, along with the lack of cellphone coverage, which can’t help but turn a traveler’s attention toward the grand, majestic show all around — the expansive mountain ranges that make up this stretch of the Rocky Mountains, with stories of mountain men and Native American tribes finding reprieve from wind-bitten days in soothing, mineral-rich waters by the base of mountains. That’s where hot springs come in, lots of them. The western third of Montana is where visitors will find the most accessible, and inviting, geothermal wonders, emerging just below the surface with temperatures anywhere from 85 to 140 degrees. In this stretch of Big Sky, Native Americans often wintered near hot springs, something noted by an early white pioneer, who saw more than 1,000 teepees gathered around a hot spring near current-day Big Timber, MT. Meanwhile, Lewis and Clark were probably the first European settlers to happen upon Montana’s hot springs, having camped near Lolo Hot Springs and boiled meat in Jackson Hot Springs in 1805 and 1806. Generations to come brought more trappers, miners and explorers to the primitive spring pools. And now come the city dwellers, like me. Sure, a spa chain membership sounds great, but it’s nothing like this. You can’t beat the feeling of being immersed in a giant, mystical wonderland, in all its icy glory, high up in the mountains as you settle into warm, bubbling, salty water, with the tranquil sight of snow-covered mountain ranges, like the Gallatin and Bridger ranges, as your companion, along with roaming wildlife like bison, sometimes just a few yards away. That’s what you’ll find at Yellowstone. While America’s first national park — home to the largest concentration of geysers and hot springs in the world — has signs all over its grounds warning visitors not to step onto geyser-rich grounds or you’ll end up on the Darwin Awards shortlist, there are a couple exceptions, including Firehole River in northwestern Wyoming, and a stretch of the Gardiner River, known as the Boiling River. Just look for signs marking the 45th parallel — that’s midway between the equator and the North Pole — and take a brief walk along a dirt path by the river. Up ahead you’ll find an improvised spa, with stones piled into place over the years to contain a mix of cool water, from the Gardiner River, along with hot spring water. 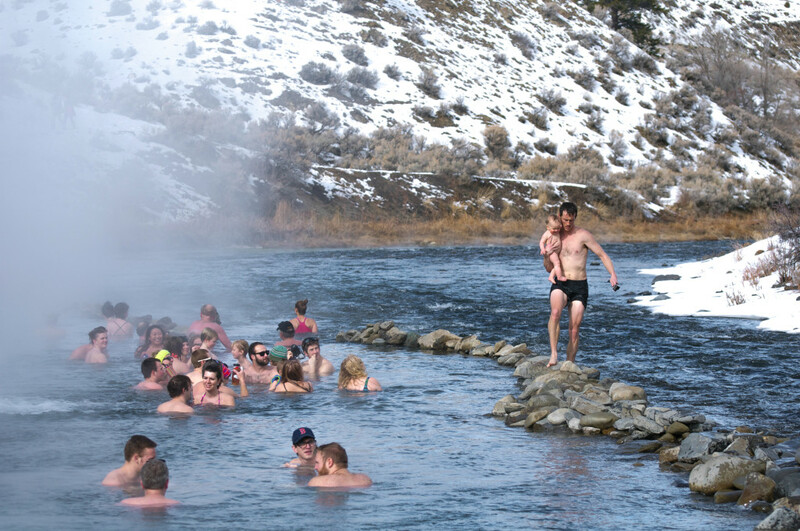 Keep the hot-springs hopping going 35 miles north, at Chico Hot Springs. Tucked in a stretch of Paradise Valley (yep, the one that inspired John Mayer’s latest album), this century-old hot springs resort near Pray, MT, has attracted everyone from outdoor legends of yore, like Teddy Roosevelt, to today’s budget traveler. The big draw, in addition to Chico’s mix of accommodations, from a high-end hotel to log cabins, is its 2 pools. Settle into an Olympic-size pool, with relaxing 95-degree water fresh from the Earth’s crust, while enjoying views of Emigrant Peak, the towering nearly 11,000-foot-high peak at the western edge of the Absaroka Range. While Chico Hot Springs attracts the crowds and occasional celebrity, White Sulphur Springs offers more relative seclusion. Three pools, fed by hot springs, make up the small property. In 1866, local Flathead Indians shared the secret of area hot springs with an early settler, James Brewer, who, in turn, saw a business opportunity and built a series of bath houses and a plunge pool. Today, the property is run by a local chiropractor, who heralds the waters, so rich in sulfate you can smell it, as on par with Baden-Baden, the famous spa in Germany. Do yourself a favor, and plunge right in. You might loosen up a few muscles (and you definitely won’t miss your cellphone), as you kick back in one of the happiest states in America, with bubbling, inviting warmth just beneath the surface.